Michael Alden Hedges was an American composer, Acoustic guitarist and singer-songwriter. Hedges’ first two recordings for Windham Hill—Breakfast in the Field and Aerial Boundaries—were milestones for the acoustic guitar. 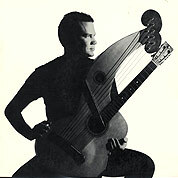 He wrote nearly exclusively in alternate tunings and played guitar-variants like the harp guitar (an instrument with additional bass strings), and the TransTrem Guitar.